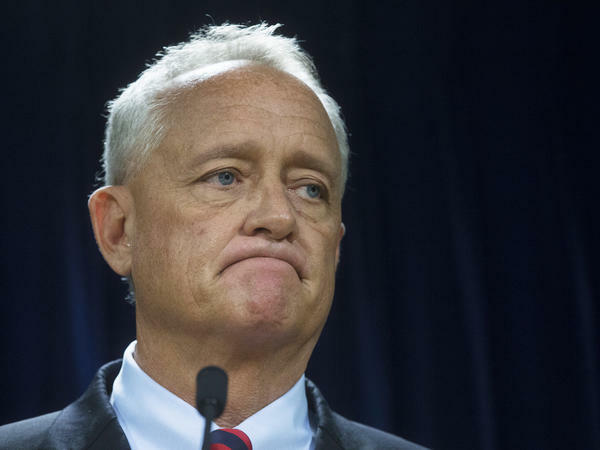 On Wednesday, Hamilton County prosecutor Joe Deters announced murder and manslaughter charges against University of Cincinnati police Officer Ray Tensing for the traffic stop shooting death of motorist Samuel DuBose. During the press conference, Deters said that "being police officers shouldn't be the role of this university." Photos of Samuel DuBose hang on a pole at a memorial on Wednesday in Cincinnati near where he was shot and killed by a University of Cincinnati police officer. American college campuses are increasingly patrolled by armed police officers. 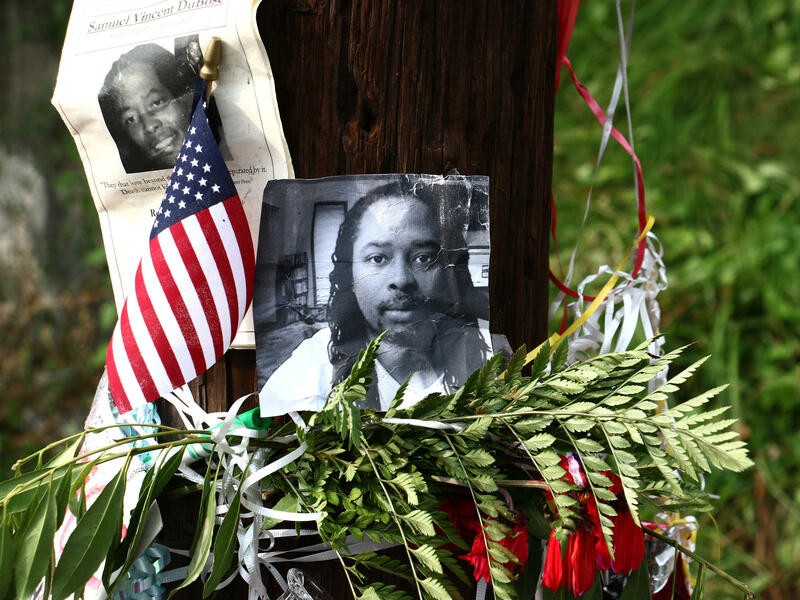 It's a trend that's getting attention after a University of Cincinnati officer was charged with murdering a black man during a traffic stop. We start this hour with a look at why universities are moving toward having their own cops and the worries that that's generating. Here's NPR's Martin Kaste. MARTIN KASTE, BYLINE: When prosecutor Joe Deters announced the indictment of University of Cincinnati officer Ray Tensing yesterday, he had harsh words about the officer's competence, saying he should never have been a cop, but then, he added this. JOE DETERS: The university does a great job educating people, and that should be their job. Being police officers shouldn't be the role of this university. I don't think so. KASTE: The University of Cincinnati is hardly unusual in having its own armed police. About 32,000 people work in security on college campuses, and about half of those are sworn officers who carry a weapon and have full powers of arrest. And that proportion is rising, says John Roman of the Urban Institute. JOHN ROMAN: More campuses are arming their law enforcement, and most of those officers carry sidearms, pepper spray and a baton. KASTE: Roman's been studying law enforcement on campuses, and he says the trend is being driven by fears of mass shooting events. ROMAN: A lot of this is a reaction to these very rare events like the Virginia Tech shooting, yes, absolutely. KASTE: Statistically speaking, mass shootings are rare, and Roman says you have to consider the tradeoff you're making for the new risk that's created by that gun in the holster of a campus cop like Ray Tensing. ROMAN: Because he was armed, he completely overreacted, and it ends up with what has been ruled as a murder. And if he's not armed, that can't happen. KASTE: But the chief of police at the University of Maryland doesn't accept this calculus. David Mitchel says first off, active shootings do happen on campuses. DAVID MITCHEL: So the question is, if that is a threat - and believe me, it is a threat - what is our response capability if you just have security that are unarmed and not trained to handle that type of threat? KASTE: And as to the broader question raised by prosecutor Joe Deters about whether universities should even have a police department, Mitchel says that's shortsighted too. He says policing a campus is specialized work. Imagine handling thousands of exuberant kids on game day. MITCHEL: It requires a lot of patience. It requires a lot of calmness. It requires a lot of professionalism. We're best to do that here. It's a niche market in policing that we do and we do well. KASTE: And on this point, John Roman at the Urban Institute agrees. Campus police make sense, he says. He's just worried about arming them, especially when they don't get the kind of regular refresher training and weapons use that city cops get, and then they patrol city streets near the campus. In Cincinnati, the university has now pulled its officers back off of those streets, and the president, Santa Ono, has pledged reform. SANTA ONO: We are fully committed to doing anything, even retraining officers, so that we can be, really, a model of public safety from a university setting. KASTE: But Ono did not entertain the possibility of disbanding his department, even as the mayor of Cincinnati, standing right next to him, said that his city police department would be capable of taking over the job. Martin Kaste, NPR News. Transcript provided by NPR, Copyright NPR.